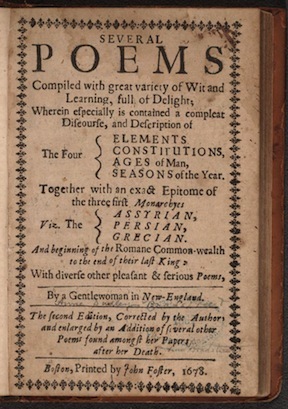 Image Credit: Anne Bradstreet (1613-1672) Several Poems Compiled with Great Variety of Wit and Learning . . . . [Tenth Muse Lately Sprung Up in America]. Boston: John Foster, 1678, American Treasures of the Library of Congress, Rare Book & Special Collections Division, Purchased from Peter Force, 1867 (177A). This is a moderated list, so subscribers will be verified before a posting will appear. The SEA listserv reflects the Mission of the society, a nonprofit organization, and is hosted by a university server, which precludes messages for promotional and commercial purposes. If you have questions about posts, want to stop a post you just sent, or need help with the archives (go to listserv.kent.edu), you can contact either one of us. Thank you.